More Fellini for you today, as Susan Patterson enjoys about three-and-two-thirds of 8½. ‘I don’t like the idea of “understanding” a film. I don’t believe that rational understanding is an essential element in the reception of any work of art. Either a film has something to say to you or it hasn’t.’ – Federico Fellini Sight and Sound , August 2004. Supposedly autobiographical, 8½ tells the story of Guido, played by an unbelievably stylish Marcello Mastroianni, a film director at the top of profession ready to shoot his next film, but completely lacking a story to tell. Surrounded by aspiring lead actresses, their agents, his crew, his rather flashy mistress (Sandra Milo), and his rather unflashy wife (Anouk Aimée) Guido procrastinates himself into fantasising about his childhood, where he is joined by his parents, clergy, his school friends. The tone is overwhelmingly sexual, with a frowsy much older woman, Saraghina, paid to dance for the boy Guido (apparently also an episode from Fellini’s childhood) and his friends, who are caught and punished by their church school. Guido’s late mother intrudes into adult Guido’s fantasy of controlling the women around him with a whip. Nothing really moves Guido’s procrastination on. But more than blocked Guido comes across as bored, tired of everything around him, of everyone, except his wife, throwing themselves on him. Everyone wants too much of him, but it is the wife who gives up on him, who finally gets his attention. Self-referential from the beginning, this is Fellini’s eighth and a half film (six features, two shorts and one as co-director). It hasn’t travelled well from 1963. Massively overlong, and overindulgent, at 138 minutes, heavy-handed with its nods towards psychoanalysis, 8½ repeats and loops around on itself never really getting anywhere. 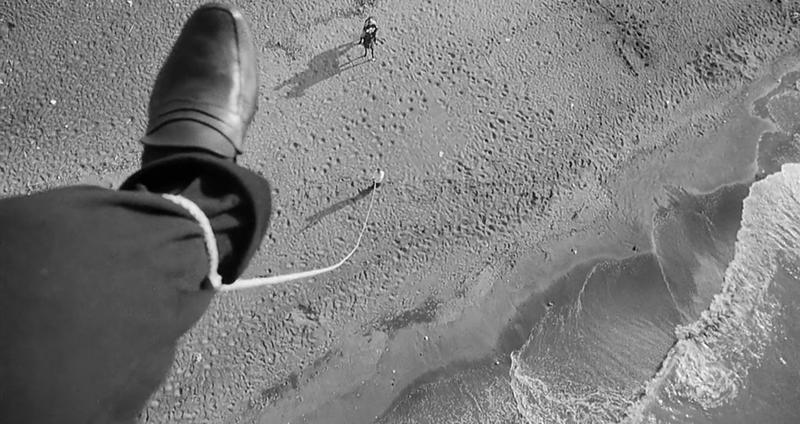 Where 8½ shines is in its cinematography and music. This is a restoration from the original negatives, and Gianni di Venanzo’s black and white photography is clear, beautiful and atmospheric. Nino Rota’s score carries the action along, and perfectly matches the parade of characters that ends the film. 8½ opens on 1 May at at the BFI Southbank, IFI Dublin, Arts Picturehouse Cambridge, HOME Manchester, ICA and selected cinemas UK-wide.